The Cures Marines Trouville Hôtel Thalasso & Spa - MGallery by Sofitel offers 103 uniquely elegant accommodations. Each one is sumptuously decorated with luxurious furnishings, complete with premium fabrics like wool and satin linens. Guests will feel at home during their stay, swept away by their room’s timeless grandeur. Guests can enjoy world-class dining at Le 1912, a Michelin-starred restaurant that serves breathtaking local cuisine from Chef Johan Thyriot. Ephemer provides another wonderful place for guests to dine, too, as its delicious brassiere menu will enchant all who sample it. And travelers will find the Thalasso Sea and Spa a welcome sight. Trouville-sur-Mer exudes a rustic ambiance that has made it a celebrated cultural destination in France’s historic Normandy region. Once a fishing port hidden away within the Cote Fleurie, this quaint seaside town has emerged as one of Europe’s most preeminent resort communities over the last three centuries. 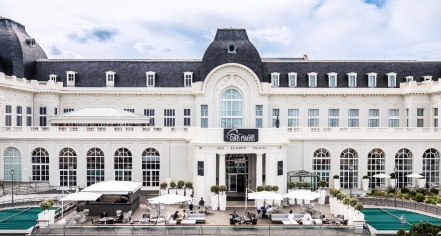 The 5-star Cures Marines Trouville hotel is housed in the right wing of the casino in the heart of Trouville and a stone's throw from the seaside resort of Deauville. Today, the area’s white-sand beaches and jade waters draw thousands of visitors each year. Cures Marines Trouville Hôtel Thalasso & Spa - MGallery by Sofitel, a member of Historic Hotels Worldwide since 2018, dates back to 1912. The beach outside the Cures Marines Trouville Hôtel Thalasso & Spa - MGallery by Sofitel was the subject of many great impressionist paintings by famous artists such as Claude Monet and Eugène Boudin. Hotel/Resort Fees & Taxes: A tax is imposed by the city: €2.50 per person, per night. This tax does not apply to children under 18 years of age. Parking: On-site parking is available for €25 per day; valet parking available. Pet Policy: €30 per pet, per day. 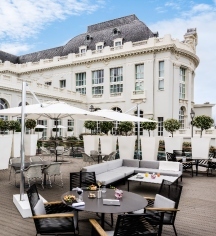 The Cures Marines Trouville Hôtel Thalasso & Spa - MGallery by Sofitel offers 103 uniquely elegant accommodations. Each one is sumptuously decorated with luxurious furnishings, complete with premium fabrics like wool and satin linens. Guests will feel at home during their stay, swept away by their room’s timeless grandeur. Learn more about the History of Cures Marines Trouville Hôtel Thalasso & Spa-MGallery by Sofitel .